The Green Bay Packers hosted the Atlanta Falcons in the second week of the 1981 NFL season on September 13. Both teams had won in the first week against division rivals, with Green Bay defeating the Bears by a 16-9 tally and the Falcons shutting out New Orleans 27-0. Expectations were greater for the visiting Falcons, who topped the AFC West in ’80 with a 12-4 record before losing a close NFC Divisional-round playoff game to the Cowboys. Coming into their fifth season under Head Coach Leeman Bennett, Atlanta had a productive offense guided by QB Steve Bartkowski (pictured above) and also featuring all-purpose FB William Andrews, wide receivers Alfred Jenkins and Wallace Francis, and TE Junior Miller. 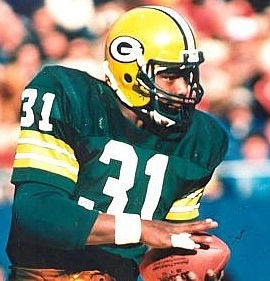 The defense was particularly strong at linebacker, including Al Richardson and Buddy Curry, who both received Defensive Rookie of the Year honors in 1980. Green Bay, coached by Bart Starr, was a disappointing 5-10-1 the previous year. 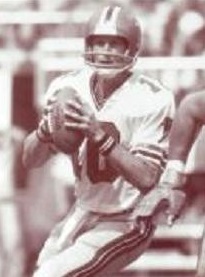 QB Lynn Dickey was an able passer when healthy and had an excellent receiver available in WR James Lofton. TE Paul Coffman was also noteworthy and FB Gerry Ellis was an effective runner and receiver. The defense had been riddled by injuries in 1980 and improvement was anticipated, with the biggest concerns regarding the defensive backfield. There were 55,382 fans in attendance at Lambeau Field and for the first three quarters, they saw their team control the game. In the first quarter, OT Karl Swanke, lined up as an eligible receiver, caught a two-yard touchdown pass from Lynn Dickey. Jan Stenerud added the extra point. Dickey tossed another scoring pass in the second quarter, this time to Gerry Ellis from 11 yards out, and Stenerud again converted. With time running out in the first half, Ellis ran 10 yards to the Atlanta six and the field goal unit quickly took the field. However, Stenerud’s 32-yard kick was nullified because Swanke was not yet properly set on the line at the snap. Still, the home team took a 14-0 lead into halftime. Lynn Dickey had completed 16 of 20 passes for 208 yards and two TDs, and the Packers outgained the Falcons by 288 yards to 173 and appeared to be very much in command. In addition, Steve Bartkowski was playing with a painful rib injury after a hard hit by DE Mike Butler in the first quarter. The Packers turned conservative in the third quarter. The only scoring came late in the period when Stenerud kicked a 44-yard field goal to add to Green Bay’s lead. The Falcons finally got on the board early in the fourth quarter when Mick Luckhurst kicked a 32-yard field goal, but it hardly seemed of concern to the home fans. The Packers had to punt on their next series and Ray Stachowitz kicked a line drive that traveled 43 yards and was returned by WR Reggie Smith, who raced past three defenders, picked up blockers as he reached the right sideline, and gained 53 yards to the Green Bay two. William Andrews plunged through the line for a touchdown on the next play and, with Luckhurst adding the point after, it was a 17-10 game with 10:35 to play. The ferocious blitzing of the Falcons again kept the Packers in check on a three-and-out series and, getting the ball back, it took Atlanta just two plays to advance 52 yards. Bartkowski threw to Alfred Jenkins twice, first for 22 yards and then for a 30-yard TD, and Luckhurst’s conversion tied the game at 17-17. The time remaining was eight minutes as the reeling Packers regained possession, and Dickey, under heavy pressure, attempted a short and poorly-thrown pass that was intercepted by LB Fulton Kuykendall (pictured at left), who returned it 20 yards for the go-ahead touchdown. Luckhurst added the point after and, in a span of 4:24, the Falcons had scored 24 points to take a seven-point lead. Green Bay still had a shot at tying the game, but after a Dickey throw to WR James Lofton picked up 27 yards, RB Terdell Middleton fumbled after catching a short pass and LB Joel Williams picked up the loose ball and ran 57 yards for the clinching touchdown. Luckhurst’s PAT capped the stunning Atlanta rally which resulted in a total of 31 fourth quarter points to win by a final tally of 31-17. The Packers had the edge in total yards (396 to 335) and first downs (22 to 19), but crucially, they netted only seven rushing yards in the second half. Green Bay also turned the ball over five times, with two leading directly to touchdowns in the final period, while the Falcons suffered four turnovers. Atlanta recorded five sacks, to three by the Packers. Steve Bartkowski completed 16 of 30 passes for 233 yards and a touchdown, although he was intercepted four times. William Andrews rushed for 87 yards on 19 carries that included a TD. Alfred Jenkins had five catches for 97 yards and a touchdown and WR Wallace Francis also pulled in five passes, for 88 yards. For the Packers, Lynn Dickey was successful on 30 of 44 throws for 342 yards and two TDs, but was picked off three times. Gerry Ellis (pictured below) gained 59 yards on 9 rushing attempts and also caught 8 passes for 47 yards and a score. James Lofton gained 179 yards on his 8 pass receptions. 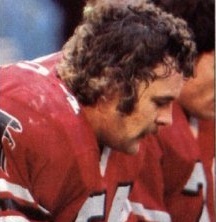 LB Rich Wingo had 13 tackles as part of a defensive effort that stymied the Falcons for three quarters. The Falcons won again the next week to reach 3-0 before dropping four of their next five contests on the way to a disappointing 7-9 record that placed them a distant second to the 49ers in the AFC West. Green Bay continued to struggle and was 2-6 at the season’s halfway point before breaking out with six wins in the remaining eight games to break even at 8-8. Steve Bartkowski had another Pro Bowl year, throwing for 3829 yards and 30 touchdowns, which made him the first NFL quarterback since Y.A. Tittle in 1962-63 to reach 30 TD passes in consecutive seasons. However, he also gave up 23 interceptions and was sacked 37 times. Alfred Jenkins was a consensus first-team All-NFL as well as Pro Bowl selection, leading the league with 1358 pass receiving yards and 13 touchdowns among his 70 catches. William Andrews placed second in all-purpose yards with 2036 and earned his second Pro Bowl selection.